There is something about having a baby that throws me back to simpler times, crafting, sewing and preparing foods from scratch (okay, my husband would say these are more complicated times - but whatev). 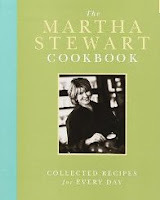 I turn to the ultimate mom, Martha Stewart (@MarthaStewart), for inspiration. I love baking from scratch too - though I do still love the boxed mix brownies too *Martha gasps* (see the ultimate "Brookie" recipe here, I just made this..and YUM! @Bakerella). I LOVE making my own baby food too - not for me, silly, for Oscar. And since my boy won't take a supplemental bottle of formula (at night, I do this so I can get some solid zzzzz's) I even make him coconut milk. My food processor is getting a workout these days. Summertime reminds me of this cake - I have made it for several baby showers I've hosted. It's light, it's lemony, and it is divine... And you don't have to be a pro at decorating either - simply dust it with some powdered sugar and add your own touch of sweet little daisies (or any flowers for that matter, edible pansies would be great too) around it - plus it covers any cake imperfections. It seriously makes a gorgeous centerpiece to any meal or party. Martha's Lemon Angel Food Cake recipe can be found in her cookbook "The Martha Stewart Cookbook, Collected Recipes for Every Day" page 510 (find it on Amazon here). Or send me a note with your email and I can send the recipe directly to you. 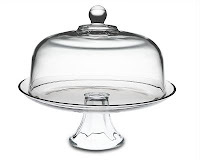 The glass cake plate/punch bowl can be found at Williams-Sonoma (LOVE this! And use it for everything.) Right now, mine is full of those Brookies slathered in chocolate Ganache - not for long though :). IDEA: how yummy would this cake be served with a dollop of raspberry sorbet, I'm sooo trying it next time I make it. mmmmmmmmmmmmm.... And make sure you put a sweet little flower bud on each plate when you serve it to your friends. They'll love you for it. What's your fave summer treat? Share the recipe with us. I love it. Lemon cake has by far got to be my favorite. I'm going to have to get a copy of Martha's book now so I can make that one. 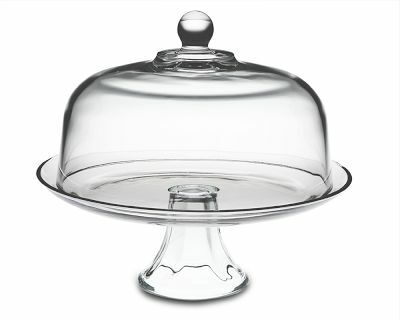 That glass cake plate is gorgeous too. I'm dying to get one with a lid like that. Fabulous. That cake is gorg! I have really been in the mood for lemon flavored desserts lately...think it's time to make some lemon bars! I totally can not relate. Love to admire your talent though!